I've got quite a few motors coming from China for these bikes and also a scooter that I've been fooling with. I found this bike on the Wal-Mart website and had to have one. I'm calling it the MoonLander. 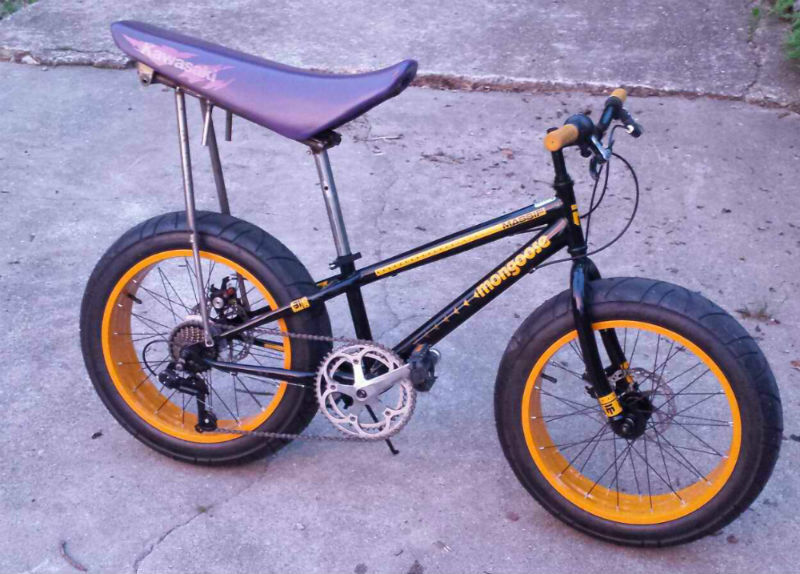 It a 20 inch bike with 4 inch wide tires. This seat is off of a the dirt bike just for testing. I'm making a similar one as this bike is so short that almost unrideable for an adult with the stock seat. I've added a better crank set and a taller adjustable handlebar quill. I've found some better rims too and may opt for those as well. Some Weinmann DHL101 20 x 4 inch. I'm thinking of mounting a 8085 KV 170 motor and reduction drive off the seat post and the rear seat stays.